According to the Administration On Aging (an organization overseen by the Department of Health & Human Services), persons 65 years or older make up 12.9% of the American population in 2009. They estimate that there will be 72.1 million senior citizens in the country by 2030, and as more people enter retirement age they’re thinking about their living options. Unfortunately retirement has changed over the years. A surprising amount of senior citizens are still in the workforce because full retirement can be expensive, and a surprising amount of seniors still maintain an active lifestyle. Thanks to the advances in medicine and affordable travel expenses, many senior citizens spend their golden years traveling around the world, seeing friends, and even dating and re-marrying. Retirement homes have also gone through a drastic change, and many seniors are choosing to live in retirement communities instead of retirement homes. There are a variety of benefits that come with living in retirement communities, and if you’re reaching an age where retirement is possible here are a few reasons why you should choose to live in a retirement community. The American Association of Retired Persons (more commonly known as the AARP) did a survey on what senior citizens look for in a home and community. Seventy-nine percent of respondents said that it was important to have a grocery store within ½ a mile of their home, but only 62% said that where they currently live it is ½ a mile from their home. Many senior living communities have grocery stores, pharmacies, and other essential businesses operating within the community so that residents don’t have to travel far. Others have shuttle services and delivery services that can supply you with your essential items. Most seniors grow up with the mentality that home ownership is an important factor when it comes to financial security, but in today’s housing marketing owning a house may not be as profitable for seniors. Home maintenance is an essential part of owning a home, and if you own an older home like many seniors, maintenance can get costly and time consuming. Regular home maintenance like moving lawns, replacing missing shingles, and sealing cracks can be expensive and taxing on the average senior’s body. If you live in a retirement community, you won’t have to worry about performing expensive and physically exhausting home maintenance tasks. You’ll always have someone to do repairs when they’re needed, and your home will always look clean and well kept. 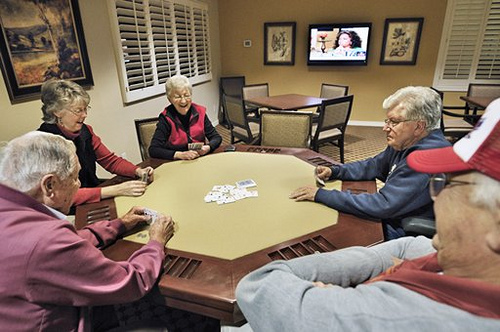 One of the biggest benefits of senior living communities is the opportunity to socialize with other seniors. Socializing isn’t just fun, it also can improve your health and quality of life. Researchers from the Harvard School of Public Health found evidence that elderly people in the US who have an active social life may have a slower rate of memory decline. A study they did found that memory decline among the most sociable seniors was almost half the rate for the least social seniors in their group.